The WebLink-MobileUp integration will provide trade associations and chambers of commerce utilizing WebLink, a MemberClicks solution, with access to efficient views of their member data in a native app format. MobileUp Software announced today the completion of a data integration with the WebLink association management system, a MemberClicks solution for trade associations and chambers of commerce. With this integration, WebLink administrators can now easily connect their databases to the MobileUp Software mobile platform and deliver information to users in a custom-branded native app (iOS or Android). The MobileUp platform accesses WebLink data on an organizational and individual level, enabling users to search for information in a variety of ways. For instance, users of a trade association can search a member directory by name or location or by a provided service - drywallers, electricians, etc. 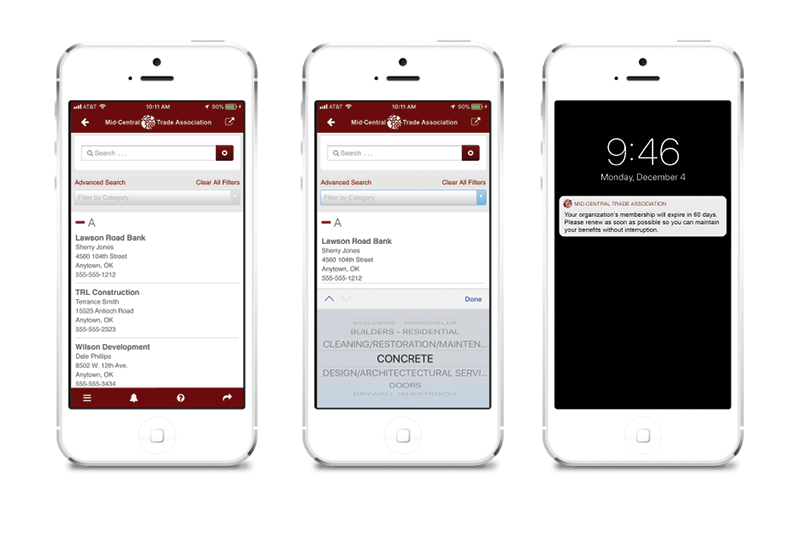 In addition to directories, apps can include push notifications, geolocations, discussion boards, digital member ID cards, event communications, and numerous other native mobile features based on an association’s membership data stored in WebLink. For more information on the integration, visit the MobileUp Software website at https://www.mobileupsoftware.com/blog/weblink-integration/ or email MobileUp Software at sales(at)mobileupsoftware(dot)com. MobileUp Software brings the development and management of custom apps to a platform level, providing schools, professional associations, and organizations with easy-to-use tools for engaging their mobile audiences with affordable custom iOS and Android apps. Learn more about the company’s custom-branded apps and mobile delivery platform at http://www.mobileupsoftware.com. WebLink is the all-in-one, configurable MemberClicks software solution that is specifically designed for trade associations and chambers of commerce. The robust membership management system, coupled with the MemberClicks team, acts as a direct extension of your staff – empowering you to save time, save money and transform the way that you run your organization and serve your members. Learn more at http://www.memberclicks.com/weblink. WebLink and MemberClicks are trademarks of MemberClicks. These screens show just some features of how Weblink’s membership data will be displayed and accessible in a native app format built on the MobileUp platform.